Since Charlton last played a competitive game, there has seemingly been a media blackout on all things Addickted. It was bad enough when, even as a Premiership club, we would be given a cursory thirty seconds on Match of the Day or Football Focus. Now it's as if we have simply ceased to exist inbetween matches, so fans increasingly turn to each other via the blogs and message boards, for mutual support and comfort. I caught up with Chicago Addick for example on Tuesday night for my own therapy, and other than his inexpicably long trip to the toilet just after the bill arrived, we enjoyed a few pints and a chat about Alan Dugdale. As if playing Scunthorpe at home wasn't bad enough, a thousand hardy Charlton fans must travel to the delapidated Layer Road for a fixture against Colchester, a team for whom Mark Kinsella played some non-League football in the 90s, before Curbs plucked up the courage to gamble £150,000 on the Irishman. 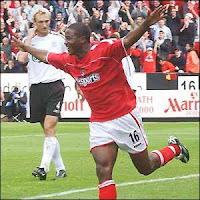 He would of course go on to become an outstandingly consistent and popular midfielder, instrumental in two promotion campaigns, and now back at The Valley. Meanwhile, alongside Pardew in the cramped dugout will be Phil Parkinson who was likewise instrumental in Colchester's promotion to the Championship, but he left to join Hull, a decision he presumably regrets, but one which ultimately led him to The Valley, much to our net benefit. On the pitch, Addick fans will need no introduction to the exciting young black striker alongside Teddy Sheringham. And won't you just know it, he'll go and score against it won't he? Luckily for Charlton, we have an ex-Colchester striker in our ranks so the famed 'score against former club' phenomenon should even itself out. There's also young Kemal Izzet in midfield, the brother of ex-Leicester star Muzzy, and a former Charlton youth team player. With Luke Varney and Madjid Bougherra now fit, and Sam Sodje available after suspension, Pards is only now really missing Moutaouakil, Thatcher and Holland, with only the French youngster likely to be missed, even with Danny Mills' calm presence in his stead. The successful 4-5-1 to 4-4-2 combination at Palace will presumably be used again, with Iwelumo asked to plough a one-man furrow, with Todorov and Varney ready to accompany him from the bench (McLeod will thus struggle to make the 16). It is doubtful whether Pards will hand Sodje his debut in a tricky game like this, and moreover McCarthy seems to have done enough to warrant his continued presence alongside Jon Fortune, even with Bougherra as another option. An unchanged first eleven is thus likely, and I thus expect the following squad: Weaver, Mills, Powell, Fortune, McCarthy, Reid, Ambrose, Thomas, Semedo, Zheng, Iwelumo. Subs: Randolph, Sodje, Todorov, Varney, Racon. NY Addick predicts: Colchester 1 (Lisbie), Charlton 2 (Iwelumo, Ambrose). Attn: 6,124. I am in fact still in the toilet! We US Reds need to stick together. If you are ever in Salt Lake I'll buy you a pint - however, it will be weaker than the sort of stuff you are used to as we have some odd laws courtesy of the Dominant religion. See you at the Ipswich game at The Valley?